Objective - Students will be able to draw a butterfly with symmetry using a crayon rubbing technique. 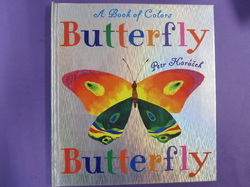 Procedure – After reading Butterfly Butterfly by Petr Horacek, the students will fold a piece of paper in half and using a black crayon draw a huge number 3 on the paper next to the folded edge. Fold the paper inside out and using a smooth river rock rub the paper. When the paper is opened there will be the wings of the butterfly. Add the details, color with crayon and paint the background with watercolor.